I have a need to set up a Postgres Replication Database. In Postgres 9.0+ they have the ability to have a read only replicated database that mirrors the live database, it can lag slightly behind the live database (although in my simple test it was spot on). The Replication DB can be read from but not written to. In my particular case I just want to use it as a failover DB that can be brought up as a live DB if ever needed. Here is my set up. I have two Ubuntu 10.04 LTS 64 bit servers with postgresl 9.1 installed. I wrote an article that shows how to install postgres 9.1 on Ubuntu 10.04 (LTS). One of these servers will be the primary (master) postgres server and the other will be the replication (slave) postgres server. I have a large postgres database already north of 100 GiB this is my Primary (master) server. This is a live server, I can reboot it, but it cannot be down for an hour or more. This is a test procedure I came up with to test first before I do it on my live server. In this procedure I have a copy of my live database and I create a test database to confirm the replication is working. Now connect to the database. Run the following command to confirm the table has been created and is working as intended. OK now that I have set up I need to create a simple program to insert data into this table on some kind of loop. I decided to write a program in python to insert to this database. I found a good how to for python and postgres at http://zetcode.com/db/postgresqlpythontutorial/ , in fact it is very detailed and easy to read, I would recommend it go check it out. 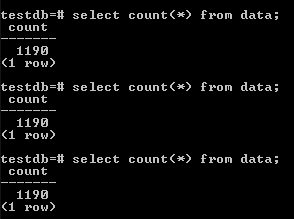 It will connect, locally to my postgresql data base and query the data table to find the largest integer in the number field. The program then increments that by one and inserts the new values (always pausing 1 second and incrementing by 1). The idea is this is constantly adding data to the database, so that I can confirm that the replication I create works correctly. First lets go find the WAL files. In my case I moved my database to another drive /database/postgresqldata/ this is set in the /etc/postgresql/9.1/main/postgresql.conf file under the data_directory field. In 9.1 its typically /varlib/postgresql/9.1/main/. But in my case I changed it. Here you should see several files that are 16MiB in size with numbers for names. These are the WAL files. In the /etc/postgresql/9.1/main/postgresql.conf file there is a wal_keep_segments field which is typically set to 0. If it is set to 0 it means that at least 0 WAL files must be kept in the queue. More typically are here as the DB needed. This setting must be increased to assure that the replication database has access to them. I have a large Database and I need to copy it over to my replication database which may take a day. This being the case it’s my understanding that I would need a day worth of WAL files so that the replication DB could catch up. Having said all that let’s get to configuring the Master (Main) DB setting for Replication Server. First lets set up the master DB to be able to allow replications DBs to get the updates they need. A few good sites I found some of this information at are http://blog.railsupgrade.com/2011/02/streaming-replication-in-postgresql-91.html  and http://jayant7k.blogspot.com/2011/12/postgresql-replication.html . Here is the “why” for each as best as I have researched. Listen to any incoming connection. According to http://www.postgresql.org/docs/9.1/static/runtime-config-wal.html#GUC-WAL-LEVEL  This must be set to archive or hot_standy . The default minimal does not put enough information in the WAL files to truly reconstruct the Database. Sets the number of concurrent streaming backup connections. I think you could get by with 1 if you only have 1 failover server, I just set to 5 because all the other cool kids were doing it. This will keep at a minimum 128 WAL files. At the default size of 16MiB that totals 2 GiB. This is a lot but I want to make sure I do not lose anything on the transfer. This just says to trust the server at 192.168.0.250, which is my replication server. I made a mistake when I first did this I did not realize there is a replication role in the database that must be designated. When I simply tried to use the postgres user I got the following error. I am using the postgres user as the replication user. To see what the postgres user has run the following command from the postgres database. Here you can see that my postgres user does not have the “Replication” Role. So I added the role to my postgres user, most sites I found suggest creating a new user that only handles replication. I decided to just go with reusing the postgres user. Now it has the Replication role! After it has been restarted I kick off my python script. I left it running in its own terminal. Then I logged into the Database and did a few quick checks to make sure that data is being constantly loaded into the database. I ran this a few times to confirm its growing in size. My first go at this I screwed it up! So you can learn from my mistake. I thought I could do a simple pg_dumpall from the primary server to the replication server. I logged into the Replication server and ran these commands. And then after setting up the replication server and restarting it (which I will get into later) the postgres would not start up and I got this error. But I did set it! So what is going on? Well looking around this I found http://postgresql.1045698.n5.nabble.com/Hot-standby-server-does-not-start-td2976362.html . Turns out you can’t simply use the pg_dumpall to copy the database if you want it to be a replication database. So here is the correct way of doing it. Now tell the database you are going to start a backup. You can still keep using your database as you normally would, there will be no interruption to incoming data. From the command line copy your data_directory folder from the primary server to the replication server. In my case the data_directory is “/database/postgresqldata/” (this is set in the postgresql.conf file). I kept the data_directory the same on both primary and replication server. Here is my command adjust it according to where you data_directory is located. After the database has been copied over run the following command from the psql, this will say the backup is done. Now that we have backed up the database to the slave/replication database, we need to change it to an actual replication database. So I copied the /usr/local/pgsql/data/recovery.conf.sample file to /database/postgresqldata/”recovery.conf and open it for editing. All the information for the replication(slave) server to connect to the primary (master) server. if this file exists the server will stop being a replication server and start being a primary server. It checks periodically for this file. And I can see that it is getting live data! So that is it you now have a replication server. If you have a live database that processes a lot of data it may take some time for the replication server to “catch up” There are a few ways to see where it is in the process. Here are two more ways to query the database to see what WAL file it is working on . > psql -c "SELECT pg_current_xlog_location()"
So how do you read this? Now from the Slave database you can run the following command. Special thanks to Ivan Stoykov on LinkedIn for clearing this one up for me. > psql -c "SELECT pg_last_xlog_replay_location()"
From the replication server I stopped and restarted the postgres server. The Replication server only has read access, let’s try and delete. And that did not work, which is how it should be. The recover.conf file defined /home/postgres/failover as the trigger_file. Create a file here and see if it stops being a replication server. Now when I log into the database from the replication server and run the following commands. I see that it is no longer getting fed from the primary database server. And it can now write to the database. Also when this occurs recovery.conf was renamed to recovery.done. Now that the Replication server has become a Primary server you can’t easily switch it back to a Replication server. Which is as it should be! Can we do the same thing in Windows Server and If yes how. Just a pointer to the solution will be greatly appreciated. Excellent post. I liked your leaving in your mistakes and dead ends so we can learn from them. Thanks loads! You have a new fan. Thanks, On short to the point posts I usually remove my mistakes, but something complex like this where you can go down odd paths and get lost I like to leave them in, mostly because we search on those error codes and I find it nice when someone posts the errors so I can find their page when searching.